As one of the concrete flooring professionals you work with concrete floors on a daily basis, either as an industrial floor manufacturer, concrete repair specialist or maybe you work with refurbishment of older concrete floors. The process you follow is likely to be very standard for this sort of job and you have probably been doing it this way for years, creating a good business for yourself and your company. But as times will tell, the competition out there is fierce and many companies will battle to get the contracts, resulting in rock-bottom prices and less profit for you. Let’s change that, now! 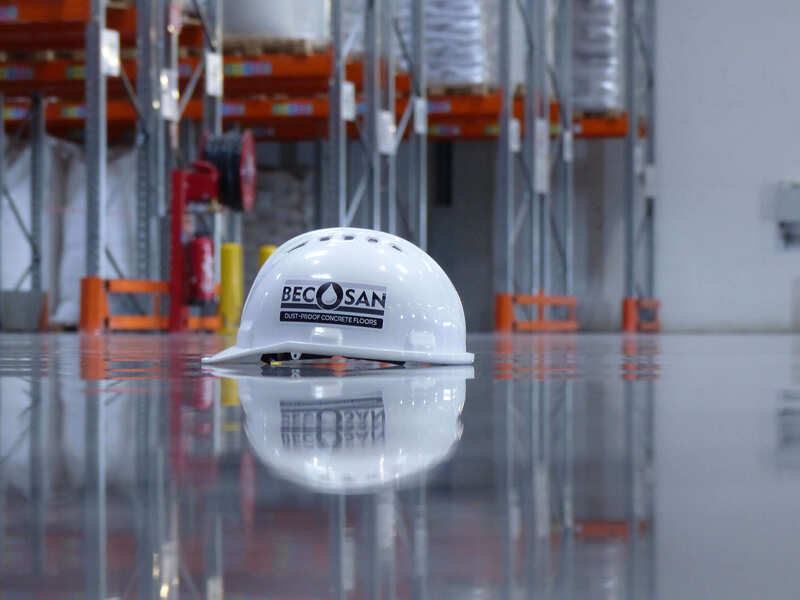 With the BECOSAN® system, you can professionally grind and polish concrete floors and, unlike your competitors, create a hard, durable and easy to clean concrete surface. The treated floor will be guaranteed dustproof and protected against water, oils and grease and chemicals. The execution of the treatment will last a fraction of the time that you have to spend per square meter with a traditional grinding machine. Your customers will appreciate the low cleaning effort. The maintenance costs are drastically reduced and employees‘ health and safety is greatly improved. This all thanks to a dust-free environment. In addition, a floor surface is created, which has preserved a beautiful aesthetic for years. All you need is water and some mild soap to clean the surface. The BECOSAN® grinding and polishing process is very easy to use. 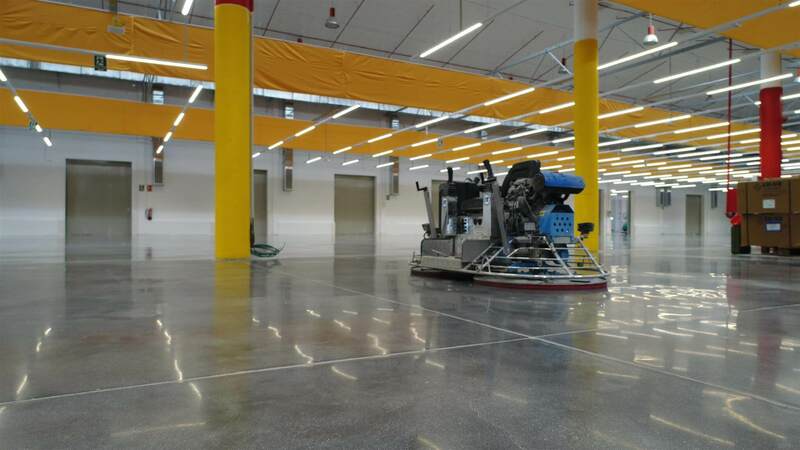 Use your existing power trowel to grind and polish concrete floors at a speed never see before You will be able to treat 700-1500m² per day, while conventional grinding systems only achieve 100-150m². During the grinding process, the top layer of the concrete surface (the micro-roughness) is removed. This eliminates dust formation and creates a very easy to clean surface. Surface coatings such as epoxy are often used for dust proofing. This should protect the floor and extends its life span. In reality, it is only a superficial coating, which is easily scratched and flakes. This leads to expensive repairs or, at worst, to a replacement of the whole floor. Your company can be more profitable by implementing BECOSAN®. BECOSAN® Densifier will harden the concrete floor and make it considerably more abrasion resistant. Thanks to a molecular reaction that takes place in the core of the concrete, dust particles are bound and they can not reach the surface anymore. Finally, the hardened surface is protected with BECOSAN® Protective Sealer, minimizing the penetration of water, oil or grease. 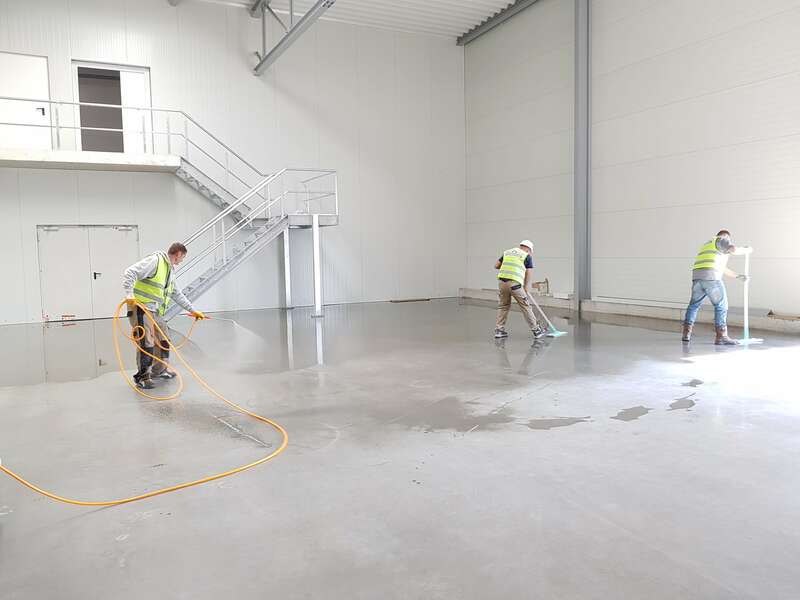 The glosson concrete floors treated with BECOSAN® is due to the fine polishing with diamond discs and has nothing in common with an expensive and film-forming wax coating. The latter needs to be renewed regularly. A very important aspect is that BECOSAN® does not use any harmful chemicals and is considered an environmentally friendly solution. The 2-step process creates a mat surface. Ideal finishing for customers that do not want a glossy floor. The treated surface is dust proof, extremely hard and abrasion-resistant. Very easy to clean surface, while absorption of water, oil and grease is minimized. The 4-step process creates a semi-gloss finish. After the application your floor is smooth, resistant to abrasion, dust proof and easy to clean. The surface is protected against water, oil or grease stains.